Probiotics are live bacteria, taken as a supplement or in cultured foods, to replenish the good bacteria that normally live in your intestines. A variety of factors including stress, antibiotics and sickness can decrease these beneficial bacteria. When this happens, your body is at increased risk of developing illnesses, such as yeast infections, which are common during pregnancy. Probiotic supplementation during pregnancy is generally considered safe, even in the first trimester, although it is always best to check with your doctor first. Taking probiotic supplements during pregnancy has not been shown to have any adverse effects on the developing baby or on the mother, according to a review in the March 2011 issue of "Canadian Family Physician." Only a very rare possibility exists that the bacteria contained in the probiotics could cause a systemic infection. Individuals who are at risk of developing this type of infection include those with compromised immune systems from chronic illness such as HIV and cancer. When such conditions are absent, however, taking probiotics during the first trimester is regarded as safe. Probiotics provide many benefits during pregnancy, including during the first trimester. Pregnancy causes many changes within the digestive system, including nausea and constipation, which can begin in the early stages. Probiotics have been shown to help regulate digestion and elimination and may be able to prevent some of these symptoms from occurring during the first trimester. Preventing such issues can eliminate the need for other medications that may carry greater risk to the mother or baby. A review in the May 2013 issue of "The Journal of Maternal, Fetal and Neonatal Medicine" reports that probiotics during pregnancy also reduce the risk of gestational diabetes and inflammation in the body. Probiotics may be purchased in supplement form from your local health food store. They also naturally occur in fermented foods such as yogurt, kefir and sauerkraut. Yogurt and kefir containers should bear the words "active cultures" to ensure the product contains these important probiotics. If you choose to eat yogurt during pregnancy, it should be full-fat yogurt, and not low-fat, according to a review in the July 2012 issue of "Journal of Nutritional Science." Researchers state that low-fat yogurt intake during pregnancy raises the risk of your child developing asthma and allergic rhinitis in childhood. However, whole milk and whole-milk products showed themselves to be protective against these conditions. 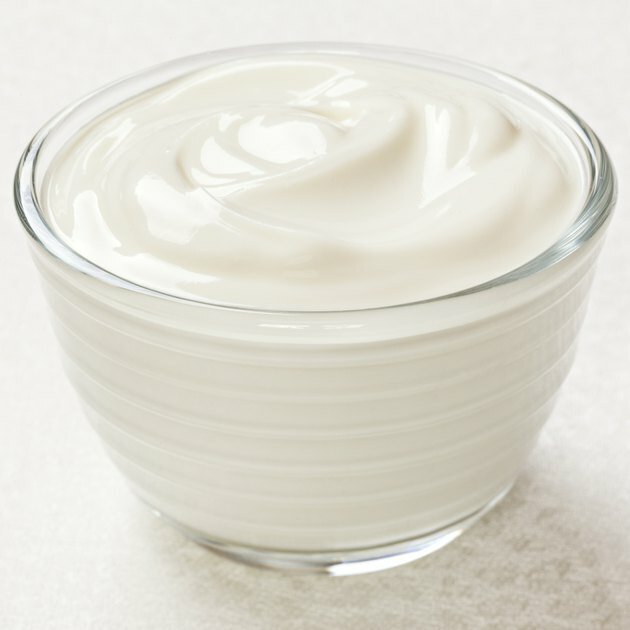 It is believed by the authors that nutrient components or additives in the low-fat yoghurt may be the cause. All of these forms of probiotics are considered safe during the first trimester, though you should always check with your doctor for approval. While probiotics are safe for most pregnant women in the first trimester, they may not be safe for everyone. Before you add probiotics or any supplement to your regimen during pregnancy, talk to your midwife or obstetrician regarding safety concerns. If your medical provider agrees, she may be able to recommend specific probiotics supplements to you. Canadian Family Physician: Are Probiotics Safe For Use During Pregnancy and Lactation? Parenting: Ask Dr.Sears: Probiotics During Pregnancy?